Hamilton, January 17, 2019– AAA is preparing to respond to thousands of emergency rescue calls over the long holiday weekend and, given the forecast, encouraging motorists to prepare as well. “Last year, over the holiday weekend AAA responded to over 7,000 calls for help – just in New Jersey alone. The weather this weekend is expected to be significantly worse, which means there is even greater cause for concern,” said Tracy Noble, spokesperson for AAA Mid-Atlantic. “Especially with temperatures dropping sharply, it is critical that motorists take every precaution to ensure their safety and the safety of their passengers”. As always, AAA reminds drivers that preparation is key. In the event of a breakdown, knowing who you are going to call for assistance and having the necessary items on hand to stay warm and safe while waiting for help to arrive can be the difference between a minor inconvenience and a potentially life-threatening situation. “The only way to ensure that you won’t run in to trouble on the roads this weekend is to stay home. For those who must drive, AAA is encouraging motorists to do everything they can - in advance - to minimize risk," Noble added. Tires – make sure your tires have a healthy tread. Insert a penny into the tread. If you can see all of Lincoln’s head, it’s time for new tires. Battery – most batteries last only 3-5 years in New England. Older batteries tend to fail in extreme temperatures. Don’t risk it. Fill up - even motorists going a short distance could get stuck in traffic or have a breakdown. Having enough gas will allow you to stay warm while waiting for help to arrive. 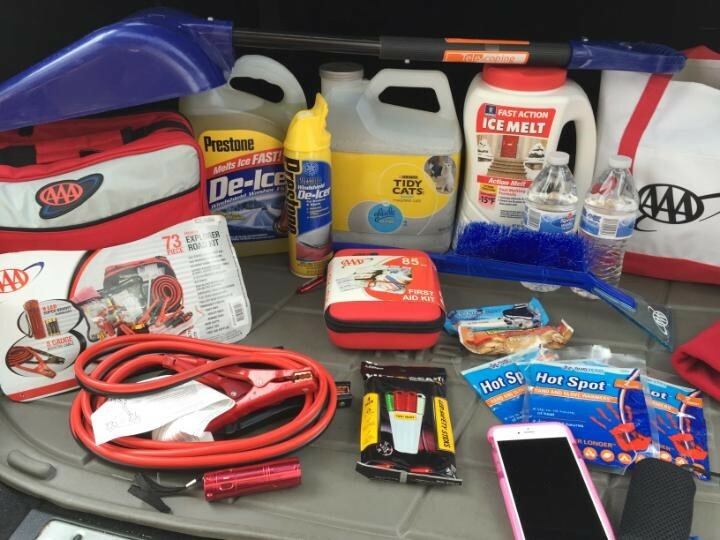 Before hitting the road, AAA is remind drivers to make sure their cellphones are fully charged and that they have a fully stocked winter emergency kit on hand. A snowbrush, de-icer, shovel, kitty litter, flashlight with fresh batteries, a bright marker so you can be seen at night, jumper cables, extra coats, blankets, medications, snacks and water – especially when traveling with children or seniors. AAA members are encouraged to program the AAA Help line and their membership number into their phones. Slow Down – At speeds as low as 35 mph, even new tires can still lose some contact with the roadway. If you do begin to skid, always look and steer in the direction you want the vehicle to go.